Sunday September 27th 1925 Lizzie and I went to church. Soon after we got home Rob Cohoon came with his family. I wrote to Hattie. We went home with them. The evening there. Monday September 28th 1925 Spent the day with Pauline. After early supper rode home with a Mr Galvin. It was raining so he brought us to the door. Better than the Bus. Read I. City papers in evening. Tuesday September 29th 1925 Went up town for Lizzie. I wrote Lizzie Duncan. We have word from Mattie Fletcher that Susan is in a hospital at Portland. Slept in PM. A letter from Warner McCall. At home reading in evening. 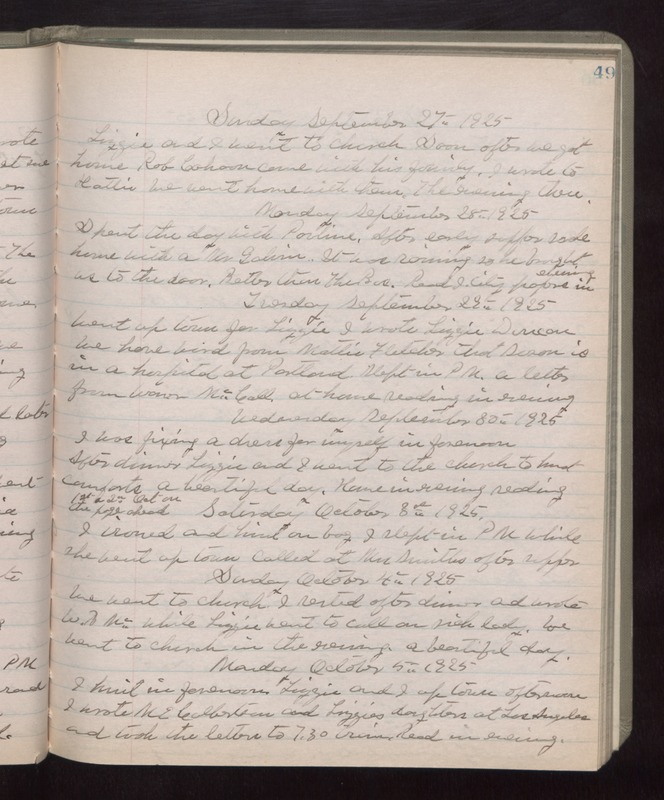 Wednesday September 30th 1925 I was fixing a dress for myself in forenoon. After dinner Lizzie and I went to the church to knit comforts. A beautiful day. Home in evening reading. 1st and 2nd Oct on the page ahead. Saturday October 3rd 1925 I ironed and knit on bag. I slept in PM while she went up town. Called at Mrs Smiths after supper. Sunday October 4th 1925 We went to church. I rested after dinner and wrote W B Mc--- while Lizzie went to call on sick lady. We went to church in the evening. a beautiful day. Monday October 5th 1925 I knit in forenoon. Lizzie and I up town afternoon. I wrote M E Culbertson and Lizzie's daughter at Los Angeles and took the letters to 7.30 train. Read in evening.